The Lil' Pocket Box is an impressive little package right from the get-go. It's light, compact, and easy to pack to the woods. It's constructed of Mahogany, and is very sturdy. Did I mention it's a compact little call? I liked that a lot about this call. 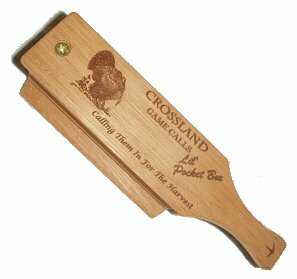 It would fit in a number of my different vest pockets, not just the one made specifically for long-handled box calls. The Lil' Pocket Box makes a wide variety of sounds with little effort - it yelps, cutts and purrs with no problem. The only thing I really did not like about the Lil' Pocket Box is that it's sounds are very high-pitched. Volume is great, but all sounds are high-pitched. I tried and tried to get a lower-pitched sound and couldn't do it. Because the Lil' Pocket Box is small, though, I can still justify carrying it along when I want to get loud and high-pitched, while still carrying my other calls that make lower-pitched sounds.